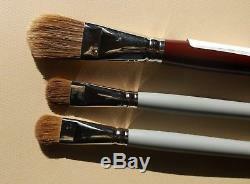 Bundle of three large-sized Da Vinci natural hair Filbert paint brushes with LONG handles. 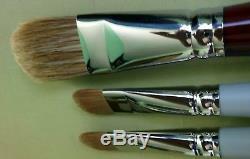 Most often used for oil painting, or could be used for acrylic painting. Size 16 (Width: 17 mm, Length: 17 mm). 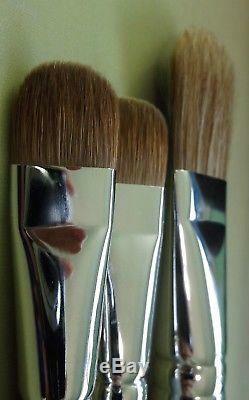 Overall brush length about 12.5, from tip to end. Natural hair: Light Ox Hair Sabeline. Size 22 (Width: 24 mm, Length: 38 mm). 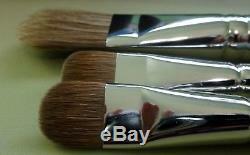 A large brush - the hairs, at the ferrule, are about 1" wide and about 1.5" long. Total brush length about 13.5, from tip to end. The Series 1824 Russian Red Sable brushes are excellent for precise, controlled brush strokes, detail work, and fine blending. 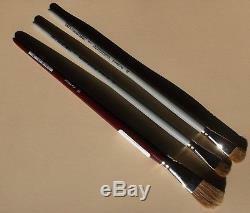 The Series 1865 brush is large in size and will hold more paint than smaller brushes to paint easily over larger areas. Absorbent hair that holds large amounts of color. 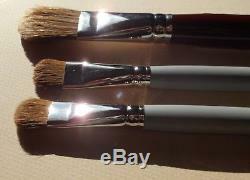 Due to the nature of some artists' paint brush offers, there may be only one offer in stock. Proceeds from this sale will help support an independent artist. 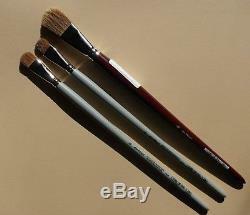 The item "DA VINCI Russian Red Sable Sabeline, Filbert Set Bundle, Oil Acrylic Paint Brush" is in sale since Tuesday, January 23, 2018.